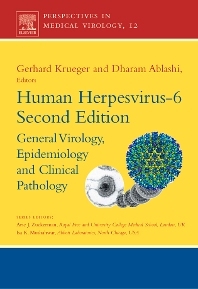 The present book presents a comprehensive review of Human Herpesvirus-6 (HHV-6) infects up to 90% of the world’s population and can cause potentially life-threatening diseases. Clinicians typically do not search for HHV-6, and if they do, they will find only few laboratories providing the necessary diagnostic tests that can differentiate between active and latent infection. Adding to this problem is that scientists still disagree about whether serological or molecular assays will be the best diagnostic test, yet there is no disagreement about the inadequacy of many of the currently existing assays. Consequently, our knowledge of etiology and pathogenesis of HHV-6 associated diseases can only come from the combined efforts of clinicians, virologists, molecular biologists and pathologists. It is the prime task of this book to summarize the status quo of HHV-6 research and to further stimulate such a collaboration. It will be a valuable reference for both clinical and basic scientists including epidemiologists, virologists, practicing clinicians and infectiologists, pathologists and essentially all scientists entering the field of herpes virus research.